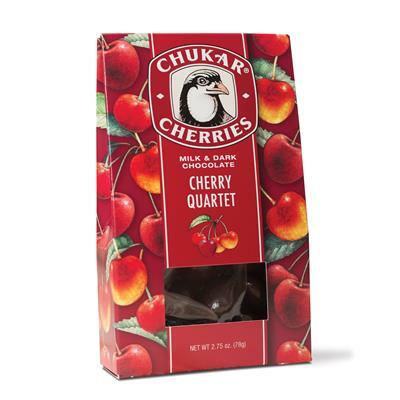 A quartet of two dark and two milk chocolate dried cherry varieties by Chuckar Cherries. Washington grown cherries covered in artisan chocolate. Cabernet Cherries: Dried Montmorency Tart cherries coated in dark chocolate with bold wine essence. Excellent when paired with a Washington red wine. Naturally dried Bing cherries surrounded by a thick layer of artisan milk chocolate. 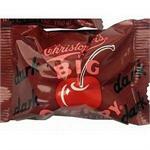 Chukar's original chocolate-covered cherry. This assortment of chocolate covered cherries comes in a full color stand up box. Freshness guaranteed. Brown & Haley's Cherry Mountain Bars - Cherry fondant filling dipped in milk chocolate. The Mountain (Or Mount Tacoma Bar) is made in Tacoma, Wa by Brown & Haley -makers of Almond Roca.